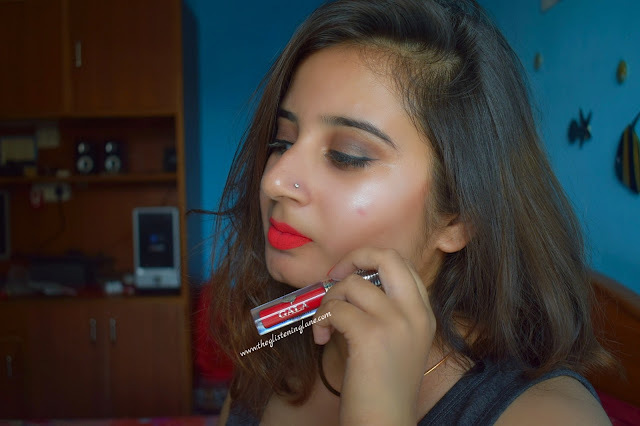 Some time back, when I was hovering over Nykaa, I noticed Gala of London Liquid Lipstick. 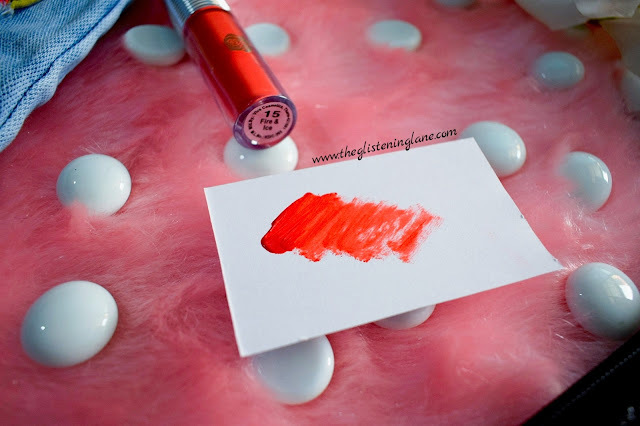 For liquid lipsticks, their price point was quite remarkable but I was unsure as to how this purchase would turn out because at that time, it was comparatively a very new brand. And there’s nothing worse than regretting about makeup purchases. This is what I was trying to avoid back then. But now that I’m a master of three liquid lipsticks from this brand, I feel why did I not try these before! Description: Give your lips a gorgeous makeover with the Gala of London Long Stay Liquid lip colours. These unique liquid matte lip shades have a unique texture that moisturizes & nourishes the lips imparting a soft sheen. These are available in a variety of shades that suit all skin tones. It comes in an attractive container with an attached wand for precise application. 💙Unique texture of a gloss with the long-lasting pigment of a lipstick. 💙Enriched with the goodness of Jojoba Oil and Vitamin E.
Additional Information: Gala of London offers a wide range of beauty products that cater to modern, stylish and trendy women. The brand is known for their innovative makeup products that are made with high quality ingredients, match with international trends, style and are affordable. 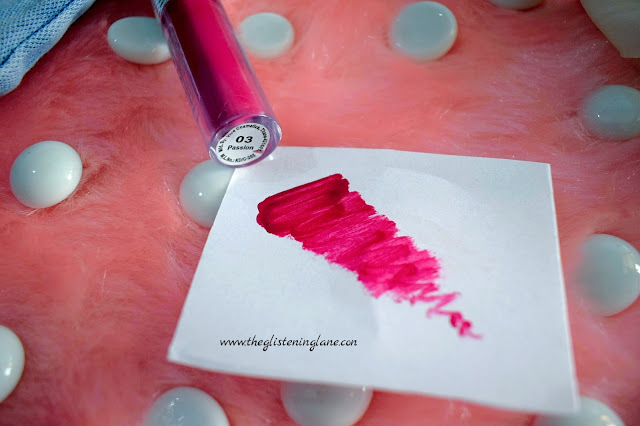 Gala of London Liquid Lipstick Online: Grab yours from HERE. As the name suggests, the shade ‘Hot Red’ is a true red with no brown or blue undertones. It is one of those shades which look quite flattering on the Indian skin tone. From fair to dusky, I believe this would look great on everyone! You can pair it up with ethnic wear, formal wear or spice up your monochrome outfit with this shade right here. If I remember it right, I think I paired it up with some ripped plus emoticon patches jeans and pale pink tee. You should go & follow me on Instagram for some cool and interesting #OOTD stories! The shade ‘passion’ is really trending on the internet. And there’s definitely a reason for it. I was wearing it to my office the other day and one of the girls inquired about the shade I was wearing. 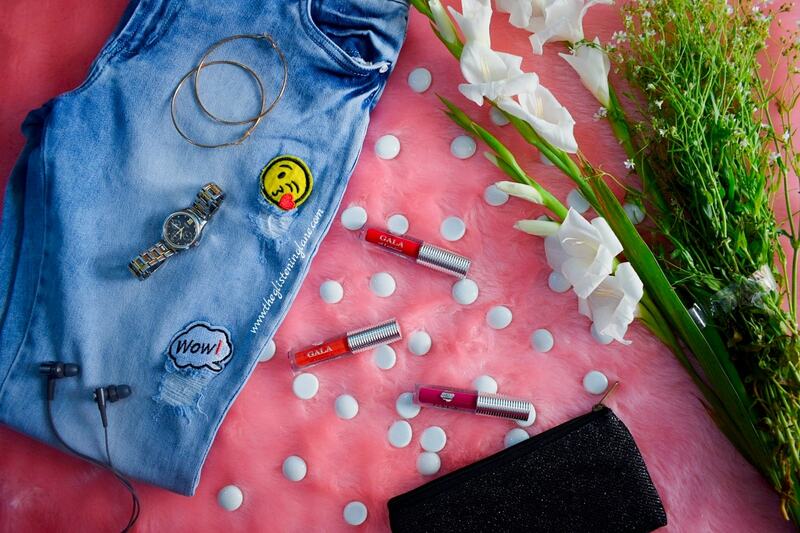 Ironically, we don’t really talk and then suddenly we started talking about lipsticks like BFFs. This shade is a beautiful berry colour which I feel is one of my favourite from the three shades that I own. It tends to look different on different skin tones but this one again is a universally flattering shade. I paired this up with some formal white shirt with blue stripes and a pair of jeggings. I have zero idea what the name should signify concerning this lipstick shade. Probably like fire is denoted with red and ice reduces the flames of fire. So, we have a diluted red which we call burnt orange! It’s not those too overt oranges which are hard to pair up with outfits. 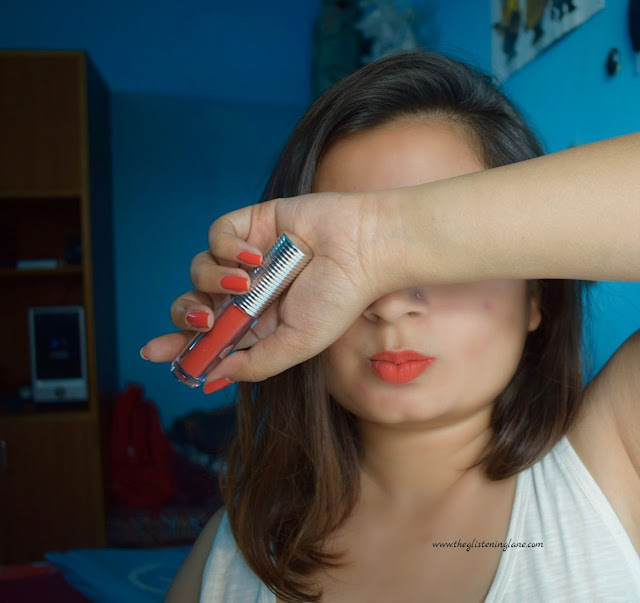 Till date, I’m not really a fan of orange lipsticks. For some reason, they make my complexion look dull. Maybe it’s just there in my head! This shade looks good with a black smokey eye and all black ethnic wear. Comment down below as to how your pair up your orange lipsticks. 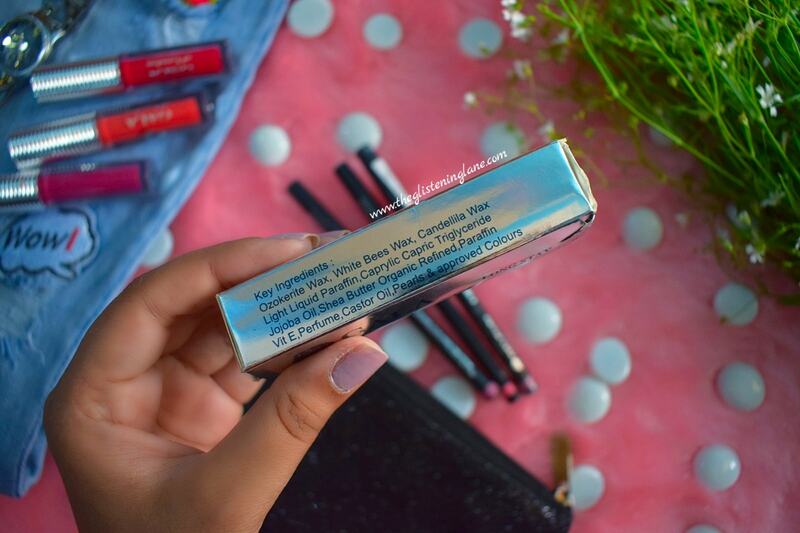 These liquid lipsticks come is a glossy silver outer cardboard packaging. Inside, you will find compact and travel friendly tubes of liquid lipsticks. 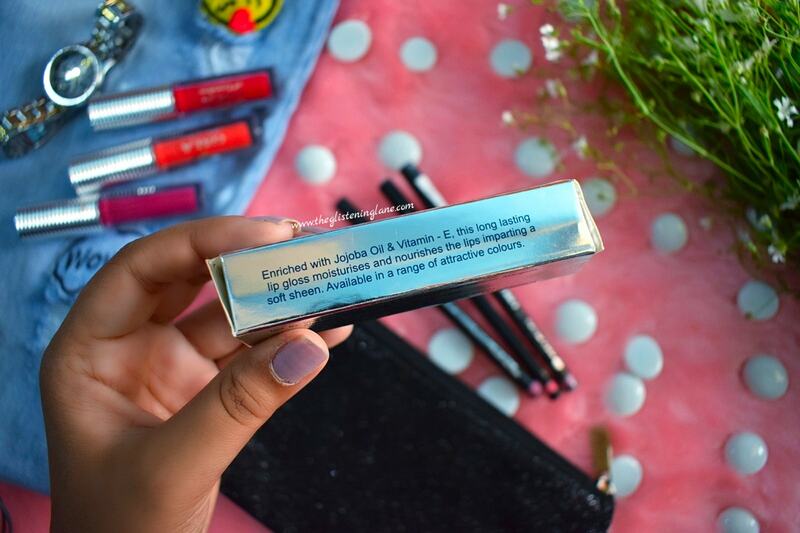 The tube of the lipstick is transparent so you can easily see the shade and how much of the quantity is left inside. The lid is silver in colour with bands running all over it. Also, the shade name and number is available at the bottom of the tube. 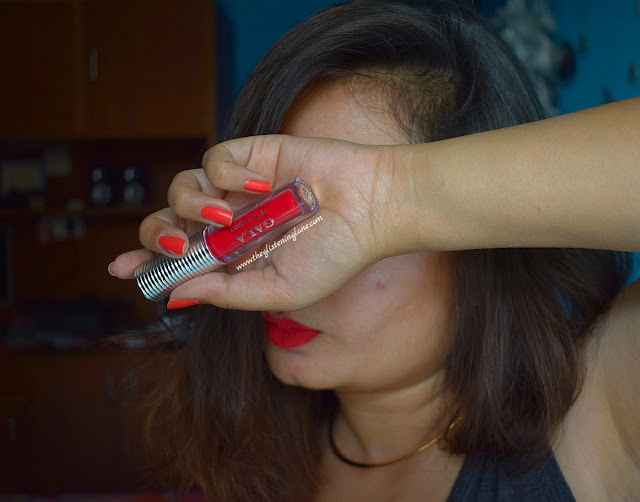 Like any other lipstick, this lipstick comes with a doe foot applicator which makes life sorted for lining as well as filing the colour inside. 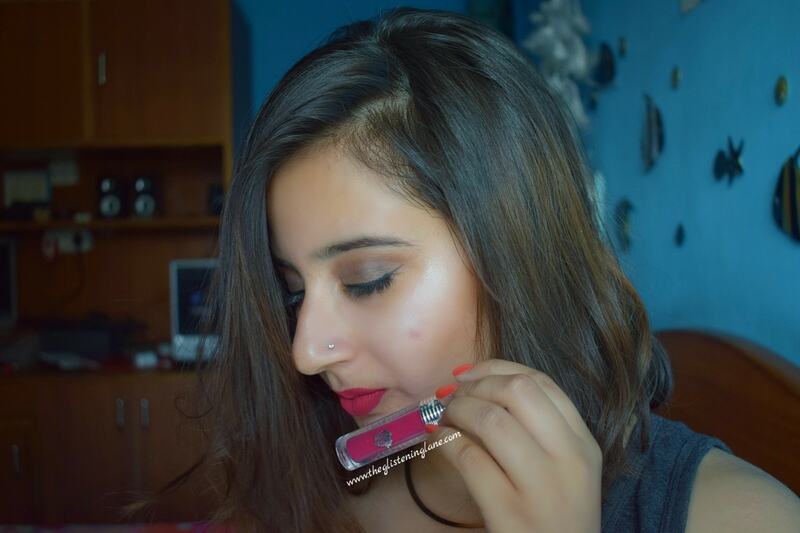 The applicator is sturdy which makes sure that you can paint your pout perfectly! If it’s the first time you’re hearing about lipsticks, “Girl, they are quite matte and drying onto the lips”! So make sure you always prep your lips by exfoliating the lips and then topping it off with some old school lip balm and things go butter smooth after that, I promise! Thankfully, these are not like super-drying that makes your lips feel uncomfortable whenever you ate or talk. They have jojoba oil inside which probably helps in hydrating the lips in a subtle manner but that does not turn your lipstick into a soft matte creamy texture. Based on my personal experience, the longevity of these lipsticks is decent. One thing I observed is that these lipstsicks fare pretty well when only one layer is applied. The lipstick stays for approximately 4 hours if you have no meal or snacks in between. But post snacks, it might get removed from certain area and reapplication seems a must because of that. Otherwise the lipstick can last long for sure. When you apply the lipstick more than a single layer, then it starts to crumble a little too much. I was having tea one day and I noticed a lot of minute crumbs all over my mug which kinda turned me off. But since then I made sure to only apply a thin layer. 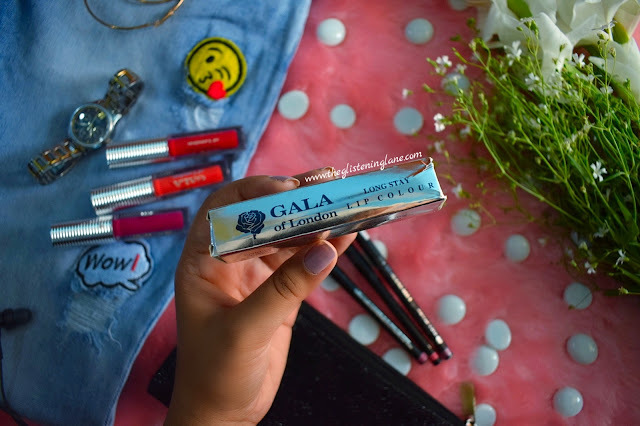 Have you tried Gala of London makeup products yet?